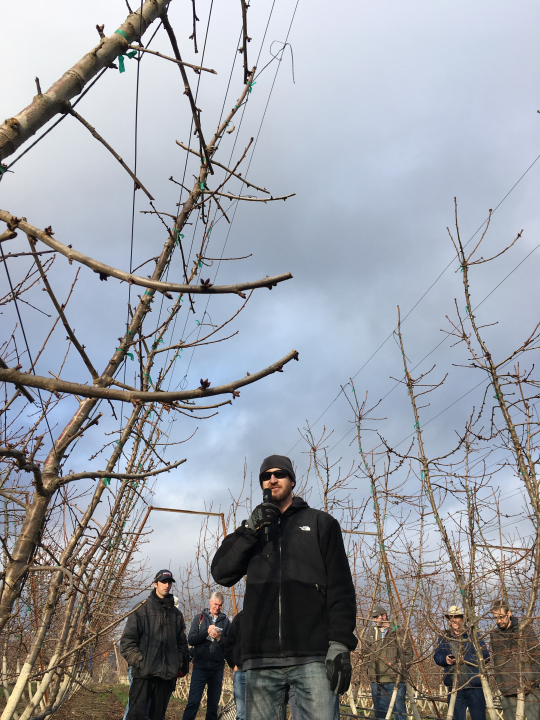 On jan. 17, Washington State University faculty Matthew Whiting and Bernardita Sallato organized an orchard systems tour in conjunction with the annual Cherry Institute meeting. This tour has always been a showcase of innovative orchard management strategies and a great venue for discussing key concepts in pruning and training. This stop featured a rootstock trial, with several cultivars (‘Sweetheart’, ‘Early Robin’, and ‘Regina’) on Krymsk 6, Gisela 6 and 5, and the MSU rootstocks Clinton, Lake, Clare and Cass. Trees were planted in 2015, trained to a super slender axe (SSA) architecture in a V-system. 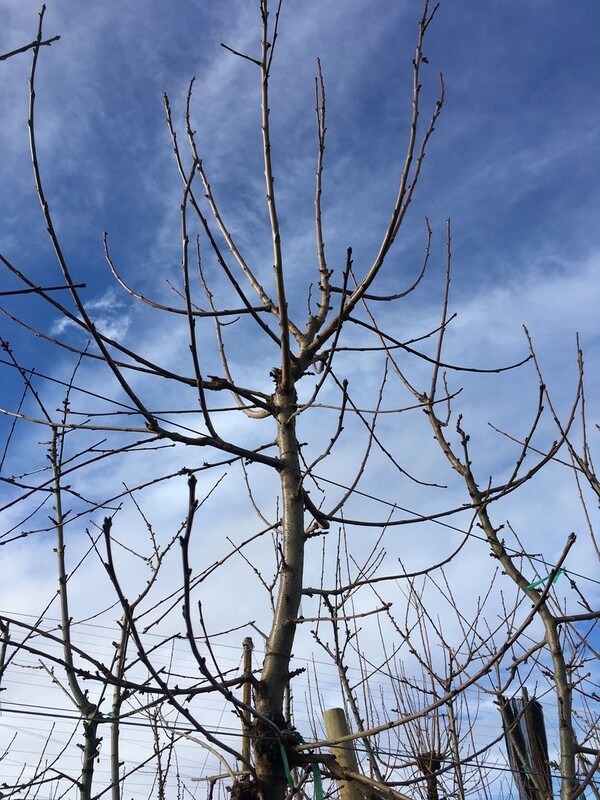 This system is typically established with very high tree densities and is recommended for rootstocks with good vigor control and cultivars that branch well and tend to form many reproductive buds on the base of new shoots. Vigor management was the overriding issue in this block – both excessive and insufficient, depending on rootstock . Summer pruning the excessively vigorous trees (Krymsk 5 in particular) appears to be a good option. This should be done after harvest to minimize regrowth. Dormant heading of the leader at the top of each tree is not suggested since this will invigorate the top and create excessive shading from strong shoots (Fig 1 right). If one does not induce significant lateral shoots from the main leader in the first and second seasons, it is difficult to induce them later. This was particularly evident for the most dwarfing rootstocks and for Sweetheart. In most trees there were only 2 or 3 lateral shoots (fruiting wood) in the bottom 6 feet. This was a key issue in the block. There was concern over the ability to renew lateral fruiting wood with rootstocks of such low vigor. Clearly, lateral fruiting wood will need to be renewed, and there may not be sufficient vigor in the most dwarfing rootstocks to generate renewals. Blind wood is inevitable in this system and another concern. The fruiting ‘zone’ moves progressively away from the central leader as flowering sites on 1-year-old shoots remain blind in subsequent years. Figure 1. The super slender axe system at the first stop. Above – Sweetheart on Clare, note the spurs and lack of lateral branching on the main leader. Below – Sweetheart on Krymsk 5, with excessive vigor in the top of the trees. This orchard was a fourth-leaf block of ‘Benton’ on ‘Gisela3’ trained to an upright V with a modified SSA system. Yield in the previous year was about 2 tons/acre – most of which was borne on spurs on the central leader. It was generally agreed that the main focus for this year should be improving vigor, particularly with the spur density and potential for heavy fruiting in 2019 (Figure 2). To address this, a strategy of aggressive dormant pruning with heading cuts into the two-year-old lateral limbs was suggested. In addition, removing weak, pendant lateral wood was also recommended. Similar concerns about the blind wood that comes from fruiting on the base of weak lateral shoots were discussed. There were many examples of 4 – 6 inches of blind wood at the base of lateral shoots. The decision was made to not train lateral limbs formally, to the wire. This is different from the structured branch positioning in traditional Tatura-style systems that are common in apples. 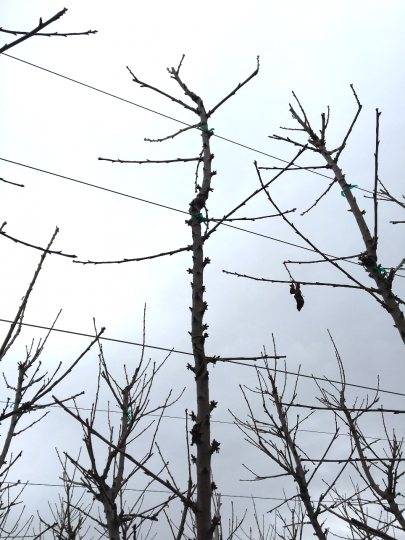 By not training limbs to the wires, training costs were minimized, and decisions to keep or remove lateral fruiting wood can be made regardless of its vicinity to a wire. 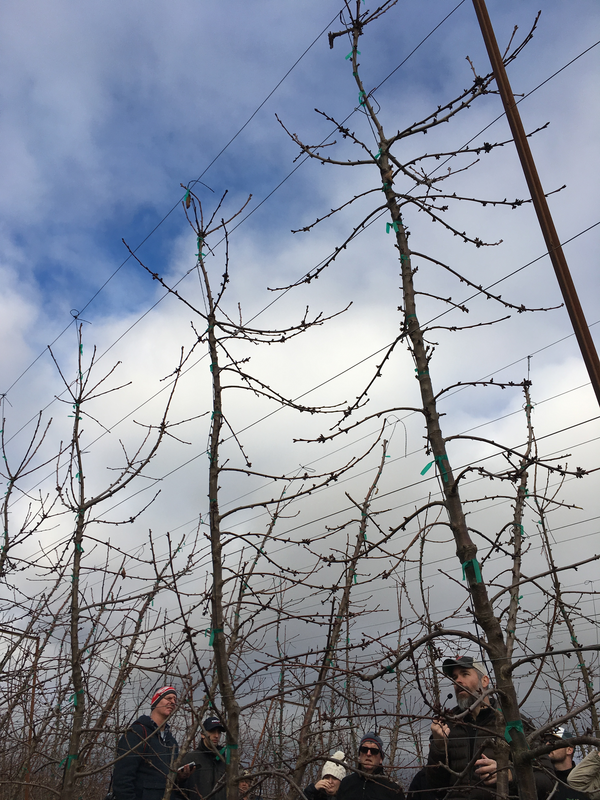 This approach should improve fruiting potential by not having to restrict branching to those shoots that are well-positioned to wires. To mitigate stress in trees on small root systems, Aran uses a mulch along the tree row and is planning on installing a shade net in 2019. Figure 2. The modified slender axe system at Zirkle Mattawa Main Ranch. Above – note the many two-year-old, unpruned lateral shoots with high spur density and weak extension growth. Below – Aran describes the heading cuts made into those two-year-old lateral limbs. We appreciate Mario Martinez and Aran Urlacher shearing their experiences and knowledge.